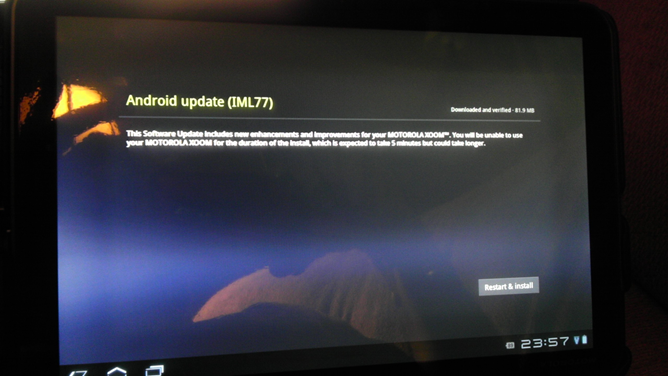 [Updated x2] Ice Cream Sandwich Update (Android 4.0.3 IML77) For Wi-Fi Motorola XOOMs Now Live In The U.S.
A few days ago, Motorola pushed out a special soak test of the ICS update to a number of Wi-Fi XOOM owners in the U.S. Apparently, no serious issues were found by the company's engineers, as the very same Android 4.0.3 update (IML77) is now rolling out to everyone. Well, everyone in the U.S. with a Wi-Fi XOOM that is. This makes the XOOM the 2nd mainstream tablet device to officially receive ICS, losing out only to the Transformer Prime that beat it to the punch by only a couple of days. Head over to Settings > About > System Updates to see if the 81.9MB update is available on your XOOM, let it do its thing, and enjoy the greatest version of Android Google has ever created. Motorola XOOM Wi-Fi owners, get ready to lick your fingers - your tablet device is the first of its kind to receive the upgrade to Android 4.0, Ice Cream Sandwich (ICS). As we’ve told you before, ICS brings a whole new look and feel to Android-based devices. We’re talking about an updated browser with faster rendering, a redesigned app launcher, richer resizable widgets, and more versatile imaging capabilities. Mix in unique features such as type with your voice capability and Data Manager to control your network data usage – and you have yourself quite the treat. In addition, this new Android version provides an updated “People” application that replaces contacts and integrates seamlessly with Google+ and other social networks, as well as a redesigned Gallery app with photo editor. Starting today, the ICS upgrade will begin rolling out in phases over the course of a few weeks, so look for a notification on your device when it’s ready for download – and enjoy! 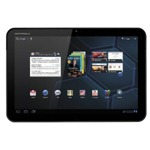 For additional details on the Motorola XOOM Wi-Fi ICS upgrade, please visit here. For additional updates on ICS upgrades across our portfolio of devices, stay tuned to our software upgrade news site. More information coming soon! Because the Motorola XOOM/ XOOM Wi-Fi here in the United States are Google Experience devices, these versions benefit from getting Android OS upgrades first. We are working through our upgrade rollout plans for Motorola XOOM owners in other regions and expect to begin a phased, country-by-country deployment later this quarter.